Russian dressing isn’t as fixed a recipe as most; it absolutely contains mayonnaise, and then either chili sauce or ketchup, and some combination of pimento, chives, onions, pickles, horseradish, and herbs. You’d think we’d have a better idea about the composition of a recipe with a 20th-century origin. 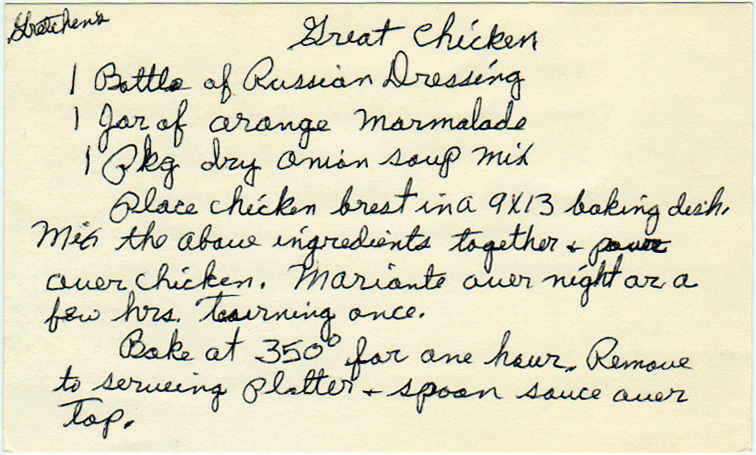 Russian dressing was invented in the 1910s by New Hampshire’s own James E. Colburn, a caterer and grocer. 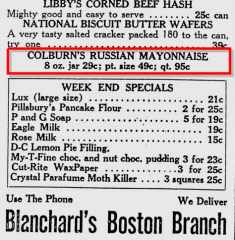 Colburn’s company produced mayonnaise, and the early labels for the dressing described it as Russian mayonnaise. 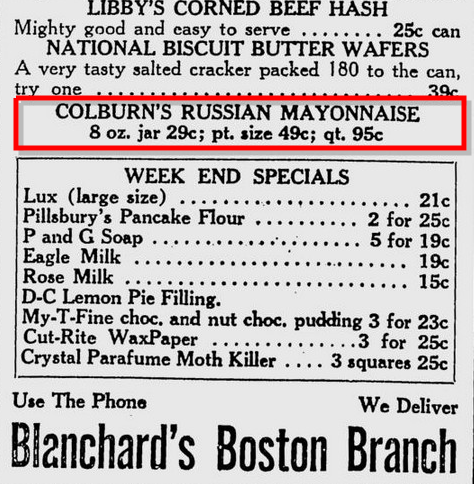 The advertisement above appeared in the June 5, 1930 edition of The [Nashua] Telegraph. So why the name? It’s tough to say. Lots of sources (including the Food Lover’s Companion) theorize that early formulations included caviar, an ingredient associated with Russia, but I’m skeptical of that, given that there isn’t a single recipe for such a dressing anywhere. Place chicken breast in a 9 x 13″ baking dish. Mix the above ingredients together and pour over chicken. Marinate overnight or a few hours, turning once. Bake at 350 deg. for one hour. Remove to serving platter and spoon sauce over top. The second of two cranberry recipes in the box. The first is here.